Will Knicks bring back Isiah Thomas? In August 2010, James Dolan tried to hire Isiah Thomas as a consultant. The hiring was essentially nixed by the NBA because of Thomas' position as head coach of Florida International University, which created a conflict of interest. 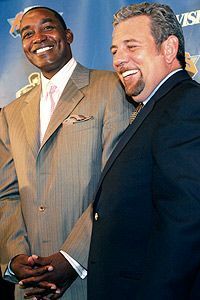 Isiah Thomas and James Dolan ... reunited at last?That conflict of interest no longer exists; Thomas was fired by FIU on Friday. Is it only a matter of time before the Knicks bring Isiah back into the fold? After all, Thomas has served as an unofficial consultant to Dolan for three years after he was fired in 2008. Dolan himself admitted as much when his attempt to hire Thomas fell through in 2010. "Although I'm disappointed that Isiah will not be working with the Knicks as a consultant, I continue to believe in his basketball knowledge, including his ability to judge talent," the Knicks' owner said in a statement released after Thomas rescinded his contract with the team. "He's a good friend of mine and of the organization and I will continue to solicit his views. He will always have strong ties to me and the team." Thomas was involved in the Knicks' pursuit of LeBron James and was given credit by then-president/GM Donnie Walsh when the team introduced Amare Stoudemire in a news conference in August 2010. Thomas later told ESPNNewYork.com's Ian O'Connor in November 2010 that he thought about running the Knicks again, "every day of the week." So there's no reason to think he isn't interested in returning to the Knicks in an official capacity. The question is, do the Knicks want to deal with the fan and media backlash associated with Thomas' return to the organization? Thomas floundered -- to put it mildly -- when he ran the Knicks from 2003 to 2008. Fans called for his ouster throughout his final weeks and months with the team. So, undoubtedly, a large segment of the fan base would be upset over the move. One thing Thomas has in his favor is the Knicks' current hierarchy. In addition to Dolan, who holds Thomas in high regard, Knicks interim GM Glen Grunwald is close to Thomas, as is Knicks interim coach Mike Woodson. All three were teammates at Indiana University. Despite his dismal record as an executive, Thomas has a history of success as a talent evaluator. If he is brought back to the organization, he may fill this role -- one away from the public eye -- best.